Barnaul (2,934 kilometers from Moscow) is the capital of Altai Territory and a transit hub for those going to the mountain resorts in Belokurikha, the city of Biysk or to the Altai Mountains. Many travelers pass through Barnaul, there’s quite a bit to see and do. Here you can learn about the secret recipes of mountain herbs and have a walk in a pinewood forest hundreds of kilometers long. Barnaul is a bright, friendly, medium-sized city on the Ob River (its population is 632,000). It was founded in 1730 by Ural mining industrialist Akinfey Demidov, who went on to build a silver-refining factory and other workshops in the new town. 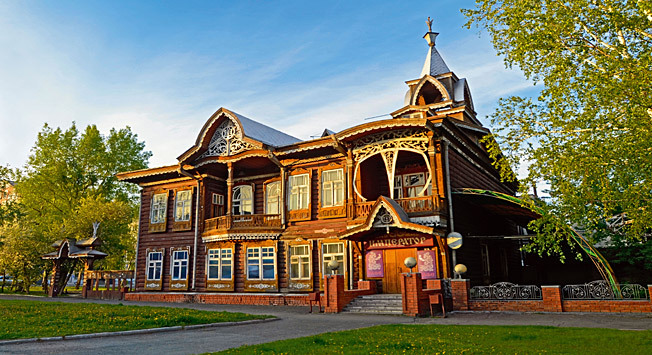 The Altai State Museum of Local History (ul. Polzunova 46) houses valuable collections on the archaeology and ethnography of the indigenous peoples of the Altai (the Altaitsy, the Teleuty and the Telengity), as well as a large model of Demidov’s silver-refining complex. There are numerous small, but original museums throughout the city that feature unique atmospheres and identities of their own. The tourist center “Gornaya Apteka” (mountain pharmacy), at ul. Polzunova 42 is located in a low-rise building known as the “House with the Mezzanine.” Its walls have been infused with the smell of Altai herbs and honey since its founding as one of the oldest pharmacies in Siberia 280 years ago. There was a time when in addition to making medicine from local herbs, they also made soap, perfume, candy and even fireworks. This pharmacy was one of the best in the entire region. The museum is housed in a meticulously-restored building that carefully preserves not only the atmosphere of an old pharmacy – an old cashier’s desk, cupboards and a laboratory – but also some unusual rarities including scales, tiny bottles, 19th-century photographs, old books and a machine for the preparation of pills. After the museum tour, you can also buy some Altai balms, herb brews, honey and desserts made from hippophaes (a deciduous shrub native to the area). The Museum of Time (ul. Matrosova 12) has grown out of the private collection of local resident Sergei Korepanov. The museum is full of amazing things from various epochs, all united by one main criterion: “the item exhibited must raise the interest of visitors from all age groups.” Here you’ll find also a 19th-century stereoscope (a device to view stereo-photographs) from Germany; a field samovar; a 1979 “Pingvin” siphon, which was used in to make lemonade in the USSR; and a Hungarian wooden mule. One of Russia’s great natural sights is Barnaul’s pine forest belt. Such forests extend in “belts” ranging from 5-40 kilometers along rivers and are the only natural oases supporting wildlife in the region. The Barnaul pine forest belt is part of the Yegorevsky Reserve and the foliage of its pines, oaks, willows, poplars and trembling poplars protects the Altai from the dust storms that reach Siberia from Kazakhstan and Central Asia. Most importantly, it is an environmentally clean area where visitors can take a hike or spend a few days. The Barnaul pinewood forest belt is 550-kilometers long and extends from the Ob River in Barnaul to the Irtysh River in Semipalatinsk in northeast Kazakhstan (3,347 kilometers from Moscow). There are numerous recreation facilities, health spas and summer camps for children, therefore it should be no surprise that locals and visitors love spending time in these quiet forests year round. In winter skiing and ice fishing are particularly popular. There are daily flights (a direct flight takes 4.5 hours) and trains (2.5 days) from Moscow to Barnaul. The railway station is located in the city center, while the airport is 17 kilometers west of the city. From the city the airport can be reached by taxi or by minibus no. 115. Many travelers also come to Barnaul from Novosibirsk, either by train (the journey takes 4-6 hours) or by bus (there are several direct buses every day).